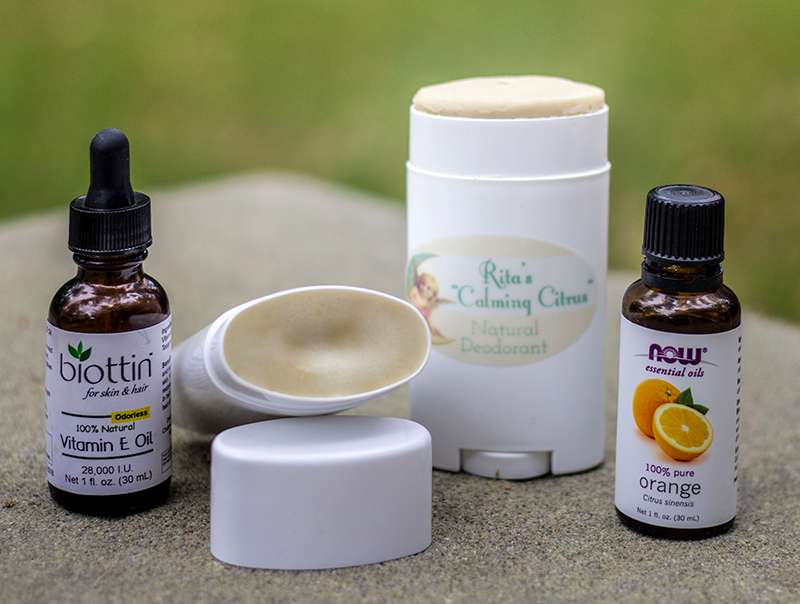 The CoffeeShop Blog: CoffeeShop HomeMade: All-Natural Deodorant Recipe! I try to minimize my skin exposure to as many questionable chemicals as possible and I love to make my own hippy-dippy health and beauty recipes. I have a 13-year-old son who can really stink (and hates to shower), so my newest extra-stength deodorant recipe was born. This recipe has been tried and tested in hot and humid Texas on a 13-year old boy, my husband, and me and it works all day! It does not stain clothing and is great for all but the most sensitive skin. I personally can use straight baking soda mixed in water as deodorant, but my husband breaks out with a painful red rash when he uses any products with too much baking soda. If you google natural deodorant recipes most contain baking soda and they work, but if you have a sensitivity to baking soda you will regret using them when your skin starts peeling off! My deodorant recipe has only a low concentration of baking soda, and it also stays firm in hot weather so we can apply it with a normal deodorant container rather than using our fingers. In this post I will link to actual products I buy from Amazon and use in this deodorant. These links are affiliate links, so thanks for clicking! I use these 2.5 ounce/75 ml empty deodorant containers, but feel free to wash and reuse ones you have purchased in the past. Or do as I have done and make your friends uncomfortable when you ask them to save up their used empty deodorant containers for you. A word to the wise, kindly suggest they wash off all hairs before they hand it over to you if they have teenage boys. 😉 I also love using these printable waterproof labels to make my deodorant look more professional. I measure hard oils in grams rather than cups. I don’t like making a sticky mess in measuring cups so this way I can just throw it all in one container on the scale. I have listed what is optional in the recipe and feel free to change the essential oil or use none at all as this recipe has a pleasing chocolate smell. I am going to try this next time with coffee-infused coconut oil and let you know what I think. Chocolate and coffee are heavenly mixed together. This deodorant will not keep you completely dry since it does not have an antiperspirant, but the arrowroot powder helps keep you pretty dry and you will be stink-free thanks to the baking soda. I usually apply it and wait a minute or two before putting on my shirt to make sure it has absorbed. I have worn this deodorant and exercised several times throughout the day, and even though I sweat I don’t stink. It really works! Weigh out or measure all oils and beeswax and add to a small glass microwave-safe container. Put it in the microwave and microwave one minute at 50% power, stir well, and repeat until all oils and beeswax are melted. Using a fork, mix in baking soda, arrowroot powder and Redmond clay. Then add the Vitamin E and orange essential oil. Mix well and pour into the empty deodorant containers and let sit at room temp or put in the fridge until firm. This deodorant should be kept at room temperature and used up within a few months. 1. If you are sensitive to baking soda (the most important ingredient in my recipe to keep you stink-free), reduce the amount to 1 tbsp and add 3 tbsp arrowroot powder. If you don’t have sensitive skin and need more protection (during the hot summer), use 3 tbsp baking soda and 1 tbsp arrowroot. 2. Vitamin E and orange essential oil are both optional. Vitamin E is supposed to be soothing to skin and work as a mild preservative, and I like the smell of chocolate and orange. If you leave out the orange essential oil the deodorant will have a slight chocolate smell, unless you use refined cocoa butter. You can also add a few drops of peppermint, lavender, tea tree, or any other essential oil you want, but remember it has to go with chocolate or it might stink. 3. You can use different weight ratios of the hard oils, as long as they measure 50 g total. I personally have found the combo of mango/cocoa butter to be the best as it quickly absorbs in the skin and doesn’t leave an oily film or stain my shirts. But feel free to try shea, mango, kokum, cocoa butter, etc in different combinations for your favorite mix. I personally don’t like to use shea butter as it takes time to absorb in skin and sometimes comes out of solution and makes little hard bumps in these types of recipes. Check out my other posts on CoffeeShop HomeMade! CoffeeShop “Providence” Fine Art Texture/Overlay Set!